Discussion in 'Backpacking' started by JosephDurham, Sep 11, 2018. I know the main focus of our forum here is Bushcraft. But, after watching A WALK IN THE WOODS my mind has been driven further into the A T and what a journey that would be. Curious, do we have anyone here that has hiked the entire AT? Or plans to do so? pedtst, Crusher0032, woodsmanjohn and 11 others like this. I dream of doing it. But so far no. JosephDurham, Winterhorse, blind & lost and 4 others like this. I would like to section hike some areas. Outdoor Dauber, JosephDurham, Winterhorse and 3 others like this. There have been a couple here who have done it. Seem to remember one guy kept us up to date on his travels. I can't quite remember all the details though. JosephDurham, Winterhorse, blind & lost and 3 others like this. Starting to make plans, but at present a through hike is going to be difficult so it will have to be in sections due to work. I have also kicked around the idea of hiking the American Discovery Trail but I will need to be retired for that one or long term unemployed. JosephDurham, Winterhorse, blind & lost and 2 others like this. JosephDurham, Winterhorse, Lichen and 3 others like this. I have always hoped to but I am afraid that medical issues and old age will cheat me out of it. Do it if you can. JosephDurham, Midwest.Bushlore, Winterhorse and 3 others like this. Member @Longbeard did the AT and contributed some great content about his trip. Though I don't think she's member here, I've also watched some fantastic Youtube videos by a hiker named "Dixie" who hiked the AT in 2016. Her channel is called Homemade Wanderlust. She did the AT, the PCT and is now hiking the CDT. She has a ton of content on thru hikes. JosephDurham, Crusher0032, Winterhorse and 9 others like this. I have hiked the entire width of the Appalachian Trail. Lg&m, darodalaf, charlesmc2 and 18 others like this. I've only hiked the Maryland section, would love to do the whole trail. Only way I can do it is a section at a time, this WORK thing is getting in the way. JosephDurham, Crusher0032, Winterhorse and 4 others like this. Always a dream but alas I am too old now and too unhealthy (heat issues) to dream about that anymore. charlesmc2, JosephDurham, Crusher0032 and 6 others like this. Well, unless you're 82 you're not too old - an 82 year old man is the oldest hiker to do the AT in one year. I have done parts of the AT in NC, NH and VA. I prefer more solitude than the AT provides though. charlesmc2, JosephDurham, Winterhorse and 3 others like this. I've got my eye set on NOBO come 2020. JosephDurham, Winterhorse, blind & lost and 1 other person like this. I did it in 2015, tried this year again but only got 250 miles due to back probs. If you have the urge, I say go for it, it is an epic journey. 8/24/15: rain, wind & tired. LogCabin, JosephDurham, Keithturkjr and 20 others like this. Shooting for 2024 when I retire. Wanted to set a stretch goal for myself in retirement and as an avid cyclist had always thought about riding cross country. The more I thought about it a cross country cycling trip would not really be a stretch goal for me. The AT would truly challenge my skills and abilities but should still be realistic to complete although not a cake walk. My challenge is managing the homefront and being away from my wife for half a year while she is still working. That's one of the troubles with hottie, younger wives. We'll figure it out but researching gear is easier than researching relationship management. My best friend walked the entire length, the white path, no hitch hiking, no skipping sections etc. A Purist thru hiker as they say. He was a frequent guest at our New England field days and gave a talk about the hike. The summer after the AT hike he walked Route 66 end to end. That Fall he suffered a ruptured aorta, which he survived, only to suffer a second one two weeks later that one killed him. I don’t know what made him decide he wanted to do it. He believed porcupines shoot their quills, and my ability to smash a rock and metal together and make fire as a kind of magic; so it was not about communing with nature or advancing his bush craft skills. He was an endurance athlete and saw the trail as just another distance event. He ran marathons and peddled Centuries too, other things that I have zero interest in. I was planning a thru-hike in my twenties. I was slowing purchasing the gear needed. At some point life got in the way. So fast forward about 20 years. Now I plan for a thru-hike with my daughter. Will it happen? Only time will tell. JosephDurham, Crusher0032, blind & lost and 3 others like this. I've only done sections of 3-10 days at a time but I've met a lot of thru's. universally, if you want to complete the AT in one season, the planning, logistics, and distance needed to cover each day will make it more of an athletic event than a walk in the woods. JosephDurham, Crusher0032, blind & lost and 4 others like this. I've section hiked 40-50 miles a year since like 2005. I come out of the woods tired, but refreshed and wanting more at the same time. It's weird. I wouldn't mind doing a much longer section when I retire in 2020, and I've always toyed with the idea of a through hike. I hike to enjoy the outdoors, get some exercise, a bit of self-challenge and the comradery. I also really enjoy working some bush-crafting into the trip, which is pretty much incompatible with through-hiking. I don't want to feel pressured to make x miles a day, batter my aging body because of an imaginary deadline, and all the other high pressure issues through hikers deal with. We'll see though. If the longer section hike goes smoothly, maybe I'd consider a through hike. JosephDurham, Crusher0032, blind & lost and 2 others like this. A through hike of a long trail never really clicked with me. I would much rather do a trail that could be done in 2 or 3 weeks such as the John Muir Tr. or the Colorado Tr. Seems like a reasonable goal and you wouldn't have as many time pressures on you and could take time to enjoy the scenery and do more than just speed from point A to B each day. JosephDurham, backlasher, blind & lost and 2 others like this. Do it. Enjoy your youth and health. I hiked for 3 weeks when I was younger - Yosemite to Lake Tahoe- we had some lay overs. By the end of the trip, I was fit, had the trail routine down, and was ready to keep going. JosephDurham, Crusher0032, blind & lost and 1 other person like this. WOW just looking at the distance across the Appalachian Trail 2,200 miles (3,500 km) geeze oh.. in comparison to Land's End (England) to John o' Groats (Scotland) is the traversal of the whole length of the island of Great Britain between two extremities; in the southwest of England & northeast of Scotland. The traditional distance by road is 874 miles (1,407 km). Yeah the movie A WALK IN THE WOODS was a good one too. JosephDurham, Crusher0032 and M.Hatfield like this. I love the thought of hiking the AT. I have read several accounts of it and it seems to be a pretty life changing event. There are some things about it that don't appeal to me though. Seems like many who do the thru end up being driven by the miles and the ounces. Stories of how they went back and section hiked and told stories of how much they missed out on by being consumed with getting distance. I am more of a journey guy rather than a destination seeker. My ex was a fast hiker. We would go for hikes in the woods and she would be cruising on ahead of me and miss so much. I would stop and look at a small flower, or animal tracks, that she would blaze right past. I do see where shorter fast hikes that test endurance will be in my near future. I am really inspired by @mtwarden and his adventures. I don't have anything like mountains around here, but we do have wilderness. I can pick a small town and bushwack cross country to get there, then call for a ride home. Or do like Gump, and just keep going. JosephDurham, Crusher0032, backlasher and 5 others like this. As a side note. I have read the AT book called AWOL. Fascinating account and it is, or was, free on Amazon. I was able to get the audio portion of it too, and listen to the book several times a year. I have very few items of entertainment on my phone. AWOL is one, and one of the proenneke movies is the other. And I guess I also have Deathwish with Charles Bronson. I have hiked sections of the trail here in Mass and further north in New Hampshire. Also been fortunate enough to camp several times in Baxter State Park and visit with folks finishing their journey up Mount Katahdin. Maybe one day I will have the time for hiking all of the trail but likely only in small section hikes. JosephDurham and Fixedblade like this. Always been a dream, hiked about 100+ miles in NC/TN "several" years ago. JosephDurham, Keithturkjr, M.Hatfield and 2 others like this. one thing about @mtwarden , he is in the west/northwest where the vistas are much bigger. on the AT, which has often been described as "the green tunnel", a lot of the sights are the close up flora and the fauna. superpaco, JosephDurham, Crusher0032 and 5 others like this. I've section hiked about 250 miles of the AT but have no desire to do a thru-hike. 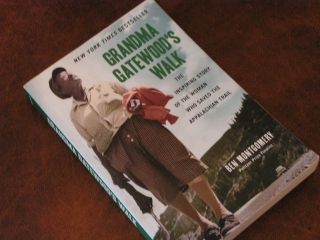 If you enjoy reading books about the Trail, this one has been a pretty good read. Emma was a tough ole' gal! JosephDurham, Crusher0032, backlasher and 4 others like this. blind & lost, JosephDurham and DavidJAFO like this. Please don't use the movie A WALK IN THE WOODS as a reference for the AT, it was horrible. Read the book. Also read Walking With Spring by Earl Shaffer, the first guy to walk the entire trail in one go. There are several other hikers' books out. More youtubers put their hikes online every year. Homemade Wanderlust is a great channel, as mentioned above, and Darwin on the Trail. This year I followed Amanda Bess and Fight for Together. The latter is by a family that has been vlogging on YouTube for a few years, but this year the entire family of eight, including the two year old, thruhiked trail. blind & lost, Crusher0032 and Longbeard like this. There are many other shorter thru-hikes to consider as well. I'm looking into the Benton McKay trail (sp?). There is a figure 8 loop which combines the southern portion of the AT. I think it is around 400 miles. blind & lost and carpenter like this. I'm thinking that you would have to be either unemployed or retired to do a 5 month walk. blind & lost, Keithturkjr, DavidJAFO and 1 other person like this. After watching the movie, I scratched it off my to-do list. After watching the movie, "The Wild", I also scratched the PCT off my list. It just doesn't look like fun. blind & lost, Crusher0032 and werewolf won like this. I did some section hiking while my brother and I were in high school. I enjoyed canoe trips more than hiking. I have sectioned hiked the AT from Caledonia State Park in Pa South to Keys Gap in VA. Just weekend trips with my scouts. Since 2016 we have had two high adventure trips that required shakedown hikes to make sure the scouts were prepaired. blind & lost and Keithturkjr like this. I would like to attempt the AZT (Arizona Trail) first after I retire, then maybe move on to the AT if I decide that thru hiking is my thing. Another guy with a YouTube channel is "Darwin onthetrail". I enjoy his videos, he has done the AT and some others, and recently completed the PCT. I've read "A Walk In The Woods" and seen the movie. A book on the PCT is "Dances With Marmots", highly recommended. I wanted to hike The Lone Star Trail but Harvey flooded and destroyed parts of it and it's been closed. Maybe this fall but age is making things a lot tougher. blind & lost, Crusher0032, WILL and 1 other person like this. A lot depends on genetics and how much a person abused their body over the years. Probably not a lot of retired Rodeo circuit riders doing through hikes. Robert Highhawk, blind & lost and Crusher0032 like this. I did it and highly recommend it. I would also recommend looking into the Vermont Long Trail if you can't swing the entire AT. I have a few other long trails on my list but I absolutely will do the AT again (unless I get eaten by a bear on the CDT). Longbeard, JosephDurham, blind & lost and 2 others like this. I have been on the trail when the bubble passes through Maryland. My observation is that it is mostly young college age kids and a mix of older retired aged types. You don't really see any middle aged people. Provided my health holds out and my joints hold up, I'll probably attempt it after I retire. Luckily that will be when I'm in my early 50's! JosephDurham, blind & lost, Crusher0032 and 1 other person like this. A walk in the woods was a great movie. I haven’t read the book yet but after watching it I think a quality book is probably what pulled actors like Redford and Nolte. I hiked a few days on it here and there, in the smokies over the years and once randomly got to spend a night in a shelter with thru-hikers. They were really neat. I really don’t know if I’ll ever try to do it myself. I’ve considered it and I’ve deducted that it is harder to get the time and opportunity to put feet on that trail than it is to walk it. Family, wife, work, it’s all hard to get away from especially when you don’t want to. JosephDurham and blind & lost like this. Thanks for all the responses. And @Longbeard ill definitely send you a PM. I’m interested to start in New Jersey and end in Pennsylvania! I was talking to my friend about it but, to do the whole AT takes time and money to keep the bills and you on the road right? Money, yes. There is no way one could pack enough fuel or food for the entire trip. Bills, depending upon whether or not one has a significant other to hold down the fort that’s willing to do such. Everyone’s circumstances vary. I read an article the other day of someone that hiked the entire AT, and he gave a complete break down of what was spent 7,000$. Of that fund, he spent 800$ on alcohol (drinking). For some it may be a necessity, but in my opinion it was a wasted expense. I’d say it’s all got to do with what you are willing to live with/ without and what becomes a necessity. blind & lost and pedtst like this. I was reading an article that recommends $1000 per month but like you said, depend on each one circumstances, for now I’m willing to hike just a small section at least.